Reassuring Quality- Adopted soft fleece lining to create skin-friendly, and warm wear experience in cold days. And sturdy stitching and flawless edge reduce unnecessary friction and provide added durability. Anti-slip Palm- Designed with multiple silicone strips on the palm and fingertips, capable to offer added friction and make you grip objects well. Touch Screen Function- Feel free to operate your smartphone, iPad and tablets with smooth fingertips, no need to take off the gloves. Reflective Printing- Not only intensify the vogue elements for your look, but also make you visible at night and keep you away from accidental injury. 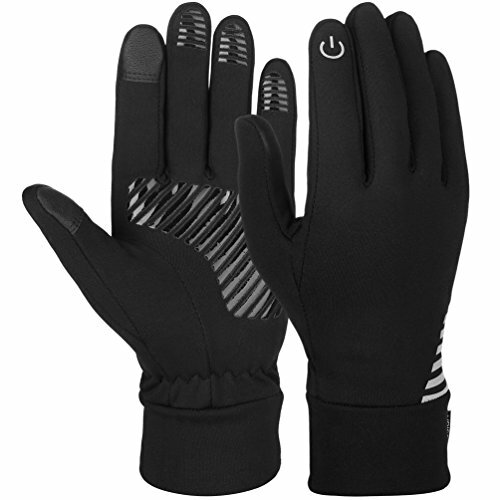 Wide Application- A perfect pair of winter gloves for both indoor and outdoor activities like playing smartphone, hiking, cycling, running, driving, etc.